The mount and blocker method is very easy but usually requires a two man team. You can drop most creatures easily using this method. 1) At the time of this post, the Darkfall AI considers a person holding up a shield while in melee range as a "taunt" and will attack that person with melee. 2) At the time of this post, the Darkfall AI will stand still if it thinks it is striking the back of a player with melee. 3) Players on mounts receive less threat than players who are not mounted. 1) One player "pulls" the mob by getting into melee range with it and holding parry while using a shield. 2) This player uses the aforementioned shield to block any ranged attacks/spells while closing. 3) Once in melee range the parrying player turns his body so that the monster is at, or just slightly behind his shoulder. Blocking player should be taking very minimal (almost insignificant), damage, if any. 4) At this point the secondary player rides up and begins to mount kick (using frontal kick) or frontal attack the monster until it dies. 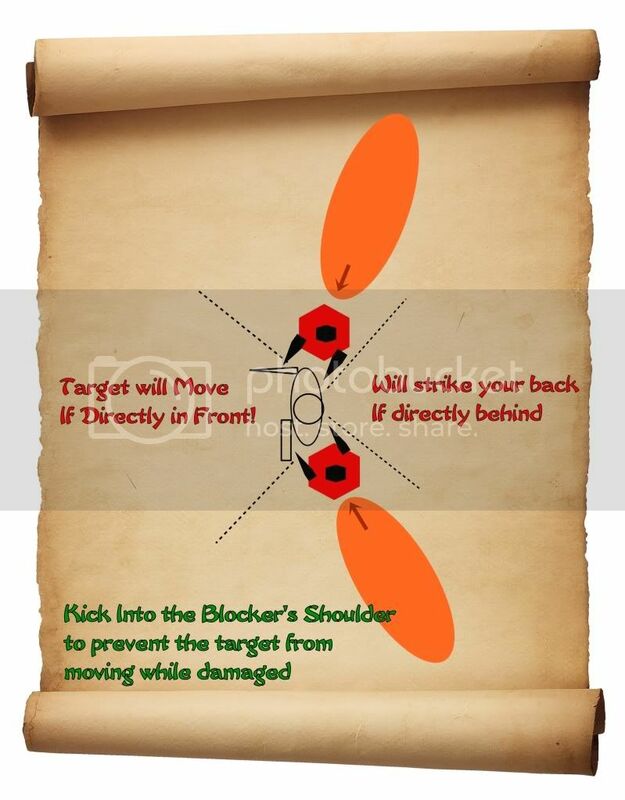 5) Rider needs to position his mount so that he is kicking the creature into the shoulder of the blocker, not kicking the blocker or kicking the target away from the blocker. 1) Multiple creature pulls behave differently than single pulls. Try to separate creatures when pulling them. 2) Tanking multiple creatures simultaneously can be done but takes an advanced understanding of the technique and very good positioning. 3) In the case of a mistake, multiple creatures in chain, or a complicated pull, rider and tank can quickly and easily switch roles by trading the mount. 4) In the case of multiple creature pulls, having a high hp mount (such as a battlehorn) and/or having a second mount spawned out of aggro range to switch to is recommended, especially if they have ranged attacks. Killing creatures in this fashion is very fast and very easy. There is no need for special positioning or "tricking" the mobs into a stuck position. Learning to partner up and do this opens the options of many very lucrative spawns which we presently let go untapped while other camps suffer from overcrowding. Finally, you do not lose durability on weapons due to mount kicking and the blocking can be done in robes with the simplest of shields. This is one of the best methods for speedy cash gain.